Rotherham United are reportedly lining up a swoop for Fleetwood Town’s out-of- contract forward David Ball as a potential replacement for Cardiff target Danny Ward. According to reports in the national media, Championship side Cardiff are on the brink of signing Rotherham striker Danny Ward in a £1m deal which could pave the way for a Millers swoop for Ball. It’s claimed Bluebirds boss Neil Warnock has agreed a fee and terms for the forward, who will have a medical in Wales this week. Ward played for Warnock at the Millers and United are understood to be willing to sell as he is entering the last year of his contract. A deal is expected to be finalised at the end of this week. Ball has been offered a fresh deal at Highbury. However, after five years, more than 200 appearances and 49 goals, it seems a new chapter might be on the horizon for the 27-year-old as he is yet to commit his future to the club. 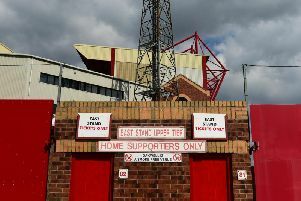 Top scorer Ball’s 14-goal haul and numerous assists helped Fleetwood to a top- four finish last season as they missed out on possible promotion to the Championship after their play-off semi-final defeat against eventual beaten finalists Bradford City. Ball’s last-gasp strike in the 1-1 draw against Southend United won him the goal of the season prize in his memorable campaign. With Fleetwood destined for another League One season, it looks likely that Ball will leave Highbury to embark on a fresh challenge. Rotherham, who were relegated from the Championship at the end of the season, appear to be heading a list of League One clubs determined to lure the forward. Ball’s departure would be a big blow for Town and the future of several other players at the club is still up in the air. Full-back Conor McLaughlin, midfielder Jimmy Ryan, utility man Victor Nirennold, defender Godswill Ekpolo and young prospect Nick Haughton have also been offered new deals. One man who is expected to stay put at Highbury is centre-half Cian Bolger. The 25-year-old former Bristol Rovers man was linked with a move to Championship side Bristol City in the national media. But Town’s player of the year is under contract for another two years at Highbury, having penned a three-year deal when he arrived on a free transfer from Southend last summer.